Rickshaws in front of the Yokohama German Club (established in 1863) on Honcho-dori in Yokohama, Kanagawa Prefecture, ca. 1880s. 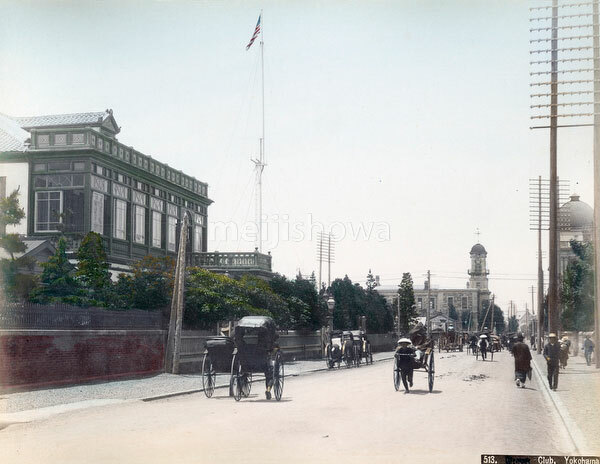 On the far right is the Yokohama post office, completed in 1889 (Meiji 22). In the back, the clock tower of Yokohama Town Hall is visible. Designed by the American architect Richard P. Bridgens (1819-1891), it was completed in 1874 (Meiji 7). Honcho-dori is also called Honmachi-dori in some sources. Maps of the time, however, use Honcho-dori.